The Wall Street Journal has released the full version of its interview with Apple CEO Tim Cook filmed at the inaugural WSJD Live conference in October, where topics discussed ranged from Apple Pay to Apple Watch and more. 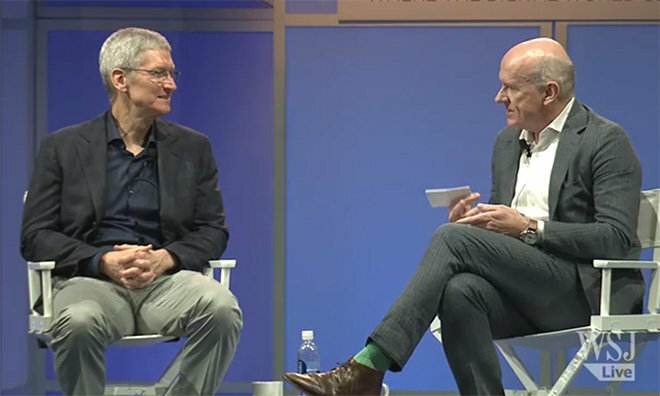 Cook's brief Q&A session with WSJ managing editor Gerry Baker failed to reveal much in the way of new information, but the Apple chief did offer insightful commentary on ongoing topics of interest like the "skirmish" between Apple Pay and Merchant Customer Exchange retailers. Unsurprisingly, Cook was bullish on the iPhone and noted the handset is expected to be a major component in overall company revenue over the near term. The iPhone currently accounts for about half of Apple's income. Cook also pointed out other areas of growth, specifically iTunes software and services, which is now a $18 billion business. For the most recent fiscal quarter, iTunes brought in $5.4 billion, up 22 percent year-over-year. In July, the segment became one of Apple's fastest-growing operating segments. On Apple Watch, Cook said Apple realizes that a smartwatch needs to be fashionable to succeed, but pointed out that the fashion industry is "totally new for us." A 34-minute video of the complete session is embedded above and can be found on the Journal's website alongside a writeup covering highlights from the talk.